Over the last several months, Smart Politics has documented Mitt Romney’s unusual pathway to the U.S. Senate. Following his decisive primary victory last month, Romney is well on his way to winning the seat of retiring Senator Orrin Hatch. In doing so, he will record the longest stretch between losing and winning U.S. Senate campaigns among major party nominees in the chamber’s history (24 years), become just the second statehood governor to win a U.S. Senate seat from another state, become one of the few failed presidential candidates to subsequently win a U.S. Senate seat in the modern primary era, and – at the age of 71 years, 9 months, 23 days – will land on the Top 10 list of the oldest elected first-term U.S. Senators. One additional noteworthy aspect that will occur when Romney is seated is the fact that he will become the state’s junior senator despite being 24 years, 2 months, and 24 days older than Mike Lee (age 47) – Utah’s senior senator beginning in the 116th Congress. Lee entered office more than seven years ago at the start of the 112th Congress in January 2011. In fact, there are currently nine state delegations in the U.S. Senate in which the junior senator is older than the senior senator. And one has an even larger gap than that between Romney and Lee. In Hawaii, Mazie Hirono (age 70) is 24 years, 11 months, 17 days older than Brian Schatz (45). Schatz was appointed to his seat one week before Hirono was sworn into the chamber following the 2012 election. Senators Hirono and Schatz don’t quite appear at the top of the leaderboard for the largest gap in age between an older junior senator and a younger senior senator since the turn of the 20th Century. For example, when West Virginia Republican Hugh Shott (born 1866) was seated after winning a special election in November 1942 at the age of 76, he was 26 years, 4 months, 8 days older than the state’s senior senator, Democrat Harley Kilgore (age 49). A few decades prior, Wisconsin Republican Isaac Stephenson – the oldest elected first-term U.S. Senator in the chamber’s history – was one month shy of his 78th birthday when he was seated. Stephenson joined the Badger State’s senior senator Fighting Bob La Follette, who was then at the tender age of 51 – or 25 years, 11 months, 27 days younger than Stephenson. 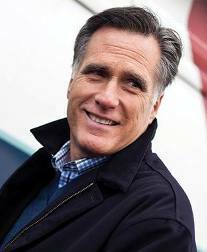 Romney will face Salt Lake City Councilwoman Jenny Wilson in November’s general election. 3 Comments on "Mitt Romney: Utah’s Next ‘Senior’ Junior US Senator"
CT: R Blumenthal (commenced 2011, with no prior House tenure); C Murphy (2013, with 6 yrs); WI: R Johnson (2011, with zero previous House tenure); T Baldwin (2013, with 14 yrs). A partial list of “senior” senators who have had LESS OVERALL CONGRESSIONAL SERVICE than home-state “junior” senators. Indeed, it is an arguably frivolous compilation. But then, so is one based on the comparative ages of in-state Senate colleagues. MEH!